What is Diesel Injector Cleaner? How Often Do You Use Injector Cleaner Diesel? Do Diesel Fuel Injector Cleaners Work? What Does Fuel Injector Cleaner Do for Your Car? When Should You Use a Fuel Injector Cleaner? How to Choose the Right Fuel Injector Cleaner? How to Use the Injector Cleaner? Diesel engines are increasingly becoming popular among vehicle owners nowadays because of their high torque and fuel economy, among other reasons. A diesel vehicle can perform well for many miles until it gets distracted by soot and other deposits that build up in the fuel injection system, that’s why you need best diesel injector cleaner. In fact all the components of the engine can be subjected to this deposit build-up if not being cared for. As caring as I am, I have reviewed the best diesel injector cleaner. 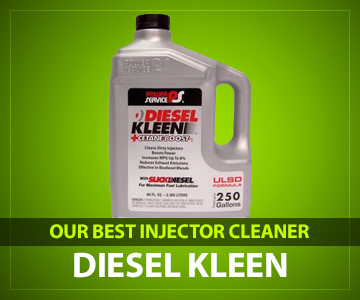 Starting off the list with the popular Power Service Diesel Kleen product, I found how effective this injector cleaner is in cleaning injectors and other internal components. The product is capable of removing the deposit formation in your injector and other engine components such as the pipes and the combustion chamber. It does not only remove but prevent the formation, which is good to let your engine free of contaminants. Also seen beneficial with the product is its ability to enhance cetane to ensure that the engine runs smoothly and performs well in colder conditions. Furthermore, it improves the fuel economy by up to 8%. That’s an added bonus to save costs because a dirty engine affects not only the performance but the fuel consumption. This fuel injector cleaner also provides lubrication benefits to the engine components to protect against possible corrosion. This is true especially for older cars that received minimal maintenance cycles. When or how often should you use this fuel injector cleaner? Well, it was designed for use throughout the year whenever you feel that your engine is producing a black smoke as a sign of deposits. But do not overuse it. Perhaps once in every six months can be a good use because the dirt does not accumulate frequently. Having got my hands on this cleaner to clean a Dodge 3500, it proved good results to the throttle response. I could witness less smoke and decreased fuel consumption. However, in the latest diesel engine, the results were just insignificant. This proves that it can be an ideal solution for old cars to revive their performance. This fuel injector cleaner is one of the most effective that could solve your engine problems. As per the manufacturer’s tests, it can improve fuel economy up to 8%. This is, of course, the benefit I am hoping for in old cars that have depreciated. However, in newer models, this cleaner may not be efficient because it is less likely to find the targeted deposits. For old models, I do recommend the cleaner. It is a product of a company that manufactures fuel injector equipment. One might say the company knows exactly the extent of carbon formations in the injector and thus has manufactured a counter-product to combat them. The product is ideal for a variety of cars such as Ford, John Deere, Isuzu, and GM. It satisfies the Cummins L10 Superior cleanliness standards. While it was designed as a cleaner of deposits in your injector, it can equally lubricate the internal components to protect them against corrosion. As a lubricant, it protects the fuel injector system against the build-up of sulfur and also serves as a demulsifier. The mileage of your car will improve by 8%. When cleaning the fuel injector with this cleaner, you do not need multiple bottles for effective results. It is concentrated enough for a bottle to satisfactorily clean 25 gallons of diesel fuel. You need to add the cleaner to the tank at least 6 times in 365 days. The product comes in a pack with 12 bottles which can treat, in total, 300 gallons. In a nutshell, the benefits of using this cleaner include an improvement of the fuel economy, restoration of engine performance and the increase of the horsepower. It was formulated to eliminate the internal diesel injector deposits that are found mostly in the Common Rail. Note: If you wish to order this product outside of the USA, it will not be shipped to you. It is regarded as a hazardous material so can only be sent via ground shipping within the USA. This is a product I would recommend to owners of old cars to revive their diesel fuel injection system. Buying the product in packs will save you money instead of buying individually. It has good benefits so I’d recommend it. But I have to warn you that it cannot be shipped outside of the USA. A blend of detergents, not sulfur additive, is designed to provide effective cleaning of diesel injectors and combustion chambers. 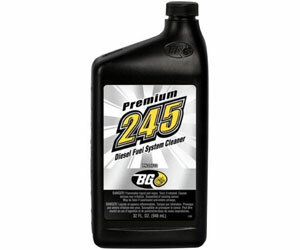 BG 245 Premium Diesel Fuel System Cleaner builds on the success of the BG 244; it comes with improved efficiency in removing the carbon deposits. The product is touted for its ability in removing the toughest deposits to leave your internal parts cleaned. As a result, you will have an efficiently running car with lower emissions, smoother idle and enhanced cold start-up. BG 245 was designed specifically for high-pressure common rail engines where most cleaners fail. I know that high pressure and temperature contribute to the formation of carbon deposits. Eventually, the engine gets a knock and the overall performance is affected. So to save you extra costs of visiting the mechanic, you might find it helpful to use this cleaner instead. In addition to being a deposit cleaner in the injector, it acts as a lubricant and cetane booster to aid in the performance. The cleaner has an industrial-strength to be used in a variety of diesel-fuelled vehicles. If you are using biodiesel systems you can also make use of the cleaner. But it is more efficient in engines that have not been cleaned before. An 11-ounce can treat 15 gallons of fuel. If you are looking for a powerful detergent to refresh your old diesel engine, this product could be a perfect gift for you. It is not an additive, but, nonetheless, a good detergent I would recommend to diesel vehicles. The BG 245 has built-up from the BG 244 which was also effective. So this gives assurance that the company launches effective and efficient products. Here’s another one of the best products I handpicked. It’s known for its ability in cleaning the diesel tank and injectors to remove the constant formation of carbon deposits. An evidence of deposits in your engine could be the black smoke from your exhaust, a poorly performing car, and other engine-related issues. Old cars are culprits in this regard. You might notice the corrosion in your tank, which needs the cleaner to lubricate. Hot Shot Secret plays that role of lubricating the engine components. Also worth noting is that the cleaner is concentrated and can treat 150 gallons of diesel fuel. There is no need to clean the injectors frequently. Maybe after 5000 miles, you can clean them especially if the vehicle is heavily being used and it is an old model. Among other benefits, the cleaner is designed to improve the cetane, thanks to its fuel stability package. It further improves fuel economy and the mileage of your car. Such effects are, however, infinitesimal in newer models. And if you’ve been worried about the maintenance of your engine, the cleaner can minimize that. Accumulation of water is also a problem in diesel engine and that can eventually contribute to the corrosion and accelerate the wear of the components if not gotten rid of. The combustion of the fuel and the cleaner can help extract that water from the fuel. The entire fuel injector system will be free of water and it will last a long time. If you are staying in a region where water has become a problem in diesel engines or your car is experiencing a plaque of engine issues, this cleaner might be the solution. It is a concentrated solution I recommend to clean up the carbon deposits. The cleaner is, however, more efficient on old cars that have more build-ups of deposits. Available in a pack of 6, that’s enough bottles to treat large gallons of your diesel fuel. The bottles are filled with powerful detergents to clean-up injector deposits. Your diesel engine will be able to breathe well and that will save fuel and enhance the mileage. If your car has been subjected to a black smoke or soot, it could be the time to use this product. In most cases, owners take their vehicles to the mechanic for engine-related problems, but then realize the mechanic merely used the engine cleaner which we could have used it ourselves. Berryman diesel injector cleaner comes with instructions on how to use clean your fuel system. Furthermore, on the benefits, the cleaner disperses the moisture that contaminates the fuel injectors. It also restores the fuel economy, decreases the carbon emissions and boosts engine performance. Moreover, it reduces maintenance needs on ULSD and low-sulfur diesel fuels. That’s an added bonus if you’ve been struggling with a failed engine. If you want to save money by buying a pack of injector cleaners instead of a single bottle, this product could be the best solution. I do recommend this 15-ounce injector cleaner for your old engine. The effect might not be seen immensely if you have a newer engine. It comes in a pack of 6 which can help you save money as well. Looking at its functions, it is a good product to have. It has a dual function as the cleaner and the fuel treatment for optimal performance of your diesel engine. It’s rare to find a product of such caliber that can optimize your fuel as well as the internal components to ensure a smooth ride. With such a product you can save lots of trips to the local mechanics and instead get your engine and fuel treated. The product comes in a pack of 12 and each weighs 8 ounces. Among other benefits, Cyclo diesel injector cleaner can improve the cold weather flow and prevent clogging. A normal wear occurs in every engine which can affect the performance tremendously. But such a normal wear can be delayed by consistently applying this cleaner to remove unwanted deposits in the combustion chambers. The other persistent problem with many engines is the corrosion. That’s a serious problem to old cars in particular. With this cleaner, you will not only clean the injectors but also coat the components with a lubricant to protect against possible corrosion. It also fights fuel line freeze as the anti-gel treatment. If you are looking for a multiple of injector cleaners, this pack of 12 could be the best solution. The product is made of powerful detergents to clean the injectors as well as to treat the fuel. It is best for light trucks, vans, and cars. The product is recommended. It is one of the effective products to clear the carbon deposits in your engine components. It can increase the power and the fuel economy by up to 4%. Having such an increase can boost your car’s performance, particularly the mileage. If you have been worried by massive carbon emissions lately, this cleaner can come to your rescue. It contains no harmful alcohol but powerful detergents to protect the upper cylinders from corrosion and to disperse water from the fuel. If left unextracted from the fuel, water can contribute to the substandard quality of fuel and lead to corrosion and build-up of deposits. You can also use this injector cleaner to dissolve varnish and gum accumulation. In fact, there is a whole host of deposits to solve with the cleaner. Although I found this injector cleaner effective, in California they have identified a certain ingredient that can cause cancer. It is not VOC compliant for California & OTC. So it is not for sale in Catalina Island. However, provided you exercise safety on it, there is no need to worry about health hazards to that extent. This product raises many questions to answer. It is not VOC Compliant for California & OTC based on an identification of a certain ingredient that is attributed to cancer. One might doubt to purchase the product if it has this safety alarms. However, to err on the side of caution, you can use the product with maximum safety precautions. It has no adverse effects on the injectors. Its benefits are not to be abandoned based on some inconveniences. It was formulated to dissolve and remove the high-temperature deposits in diesel engines. In turn, this optimizes the performance of the vehicle and also reduces the noise. Soot emissions are an order of the day in a dirty engine due to the formation of deposits particularly in older vehicles. Not only injectors are affected by the accumulation of dirt but also the combustion chamber. Using this cleaner could solve most of the engine-related issues that lower the performance and consumes more fuel. This 500ml diesel injector cleaner is sufficient to clean a tank of fuel. While cleaning the deposits, it also enhances the cetane rating which will reduce ignition delay and engine knocking. If your car is frequently maintained, this diesel injector cleaner may not be that effective. But for those who use their cars infrequently or the ones with old cars, it can be the best solution to revive your engine. The cleaner possesses a good potency that will address the issues such as heavy carbon formation, rough idle, heavy fuel consumption and soot emissions that often plaque diesel engines. The results of using the cleaner include less electrical problems, improved horsepower and fuel economy. The other benefit is the lubrication of the internal components. 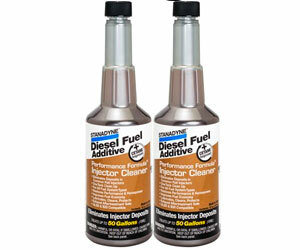 This 500ml diesel injector cleaner is a good product to consider for infrequently used cars or old cars. I recommend it for such vehicles. It has a powerful formula that dissolves and removes the resins and heavy carbon build up in diesel engines. If you are the mechanic and looking for the best product for your services, the ACDelco Fuel Injector and Upper Engine Cleaner could be the ideal product for you. You will not find this product in retail stores as it was formulated only for professional use. That means it’s of a different standard from the rest of retail cleaners. Looking at the features of the cleaner, it shows that it was designed for multiple service applications. It is a product of choice for in-rail injector cleaning, soaking up the piston and combustion chamber deposit removal. The main aim is to optimize the performance of the engines because engines accumulate dirt as time goes on. What you need is an effective cleaner to solve such problems. For cars that you find having idle challenges, intense soot emissions or struggle to start, you can use this cleaner to solve such issues. The cleaner was designed with a low VOC (Volatile Organic Compound) emission formula. It’s a formula revered by many mechanics as being effective in diesel injector cleaning. It’s a 16-ounce product sufficient to clean large tanks. However, you should not pour the cleaner directly into the tank as it is not used like any other cleaner. Follow the instructions given or ask a professional mechanic. This is one of the powerful products designed with a low VOC formula to solve soot emission problems by cleaning the entire fuel system. I recommend this product, but it was designed for professional use only. Considering its features, it is a great product to solve your engine-related problems. However, note that you are not supposed to pour it directly into the tank. Now here’s the last product on our list, the Royal Purple Diesel Fuel Injector Cleaner. If you are concerned about a reduced fuel economy and hardships of cold flow and ignition, with this cleaner you can solve the issues. It contains 20 ounces, sufficient for a diesel fuel tank. When added to the tank, it will remove the deposit formation in the combustion chambers, valves, pistons, injectors, and carbs. On top of that, it will boost your ignition time and improve the cold flow. These are issues related to a dirty diesel engine. Avoid extra costs of a mechanic and do-it-yourself. Cleaners come with instructions to treat the engines. That shouldn’t be a problem understanding how they work. However, note that the engine issues can be attributed to other factors other than the deposit accumulation. If the problems persist, you may want to visit a car service center. When applying this cleaner, note the recommended dosage of 1 ounce per 5 gallons. For maximum benefit, if you feel your engine needs a serious cleaning, you can apply 1 ounce per 2 gallons. The good side of the cleaner is that it is compatible with any grade of diesel fuel. 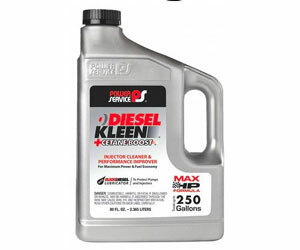 And beyond the cleaning process, it can provide lubrication to extend the life of your diesel engine. For a variety of applications such as cleaning and reducing carbon emissions in your engine, I recommend this product. It is a good product that matches any grade of diesel fuel. To help you understand these products and choose wisely, I have compiled a buyer’s guide here for you. For more information, you can post a comment and I will attend to it. It is an additive or a solution of detergents designed to improve the quality of fuel and the combustion chamber. It achieves that by cleaning the injectors and other internal components such as the intake valves, pistons, and carps. Diesel engines are susceptible to deposit formation at high temperature and pressure. If not treated, they can affect the performance of your car. The other benefit of the cleaner is to solve the black exhaust smoke and the fuel consumption. A dirty engine shows such issues. The car might struggle to start especially in cold environments. Cleaners are now abundant in different models and qualities to treat your cars. The frequency of using the diesel injector cleaner varies from one product to the other as well as one engine to the other. For instance, the highly concentrated cleaners may need to be used twice a year while the diluted several times. It also depends on how dirty your engine is. But, typically, you should use the cleaner after at every 5000 miles. Every product should have these instructions. Take a look at the back of the bottle. If unsure still, consult your local mechanic and ask for advice. Yes, they do work. But in newer models, it may be hard to spot their effects. They are effective in older car models where deposits form intensely. As combustion occurs, deposits are formed as byproducts. When they accumulate, they can clog the engine and affect the performance. The cleaners work by dissolving such deposits and let them escape through combustion without damaging the engine. Yes, they do really work but depends on the type of the additive. Most of them are touted the best in removing the engine deposits and improve performance. Some are even touted to work perfectly in older engines. Well, some tests have shown that not all additives work. Some can actually affect the engine performance by 2%. That said, you need to be vigilant of the type of additive you use. Of course, most additives are being marketed as the best, but when reality hits you find out they are not what they are being marketed for. There are many benefits associated with fuel injector cleaners to your car. Interchangeably referred to as carburetor cleaners, they clean the entire fuel system to improve its quality. The cleaners come in different formulas that are added to the tank to remove the heavy carbon deposits. However, some are not allowed to be added directly to the tank. In addition to removing the deposits, the purge water from the fuel. Excess water in the fuel can lead to corrosion and other engine related problems. But a powerful injector cleaner can solve such problems. It can also help with lubrication of the cylinders, valves, and injectors. By achieving all these functions, the vehicle can save fuel and perform much better. The symptoms can vary from one engine to the other. But, generally, you may witness starting issues, black smoke emissions, poor performance, increased fuel consumption, poor idle, poor cold flow, poor throttle response, corrosion on engine parts, etc. Such symptoms signal the need for a cleaner. The cleaner works as you drive. Please note the requirements per ounces of the fuel injector cleaner. For instance, you might realize that a certain cleaner instructs 1 ounce per 2 gallons. If you have less diesel fuel, you may have to replenish until you meet the requirements. After ensuring that you have enough diesel fuel, follow the instructions and add a specific amount to the tank to clean. It will work as you drive along. Wait until you complete about 5000 miles and add again. Please note that not all cleaners work with every type of engines. You need to be vigilant of the model you are buying. Read carefully the instructions of the fuel injector cleaner to see if it is fit for your car. The mistake that many car owners commit is to choose the cleaners based on the price. Other engines degrade in performance because of the wrong additives added in the tank. It is relatively easy to use these cleaners. Read the instructions carefully and check your fuel level. You would have first ascertained if the cleaner is the right one for your engine. Note that wrong applications can heighten the problems instead of solving them. I have come to the end of my review of the best products on the market as well as the buyer’s guide. The best diesel injector cleaners are indispensable for every car, particularly those that have old engines. Many cars experience a degraded performance because of the carbon deposits forming in the injectors. Moreover, water in the fuel can also lead to corrosion. Such issues can be solved by using the injector cleaners. In the review, I have highlighted all the features of the 10 cleaners on the market as well as their pros and cons to sort out the very best best diesel injector cleaner. Although I handpicked these as the best, it is your responsibility to ensure that a certain product is suitable for your engine.